". 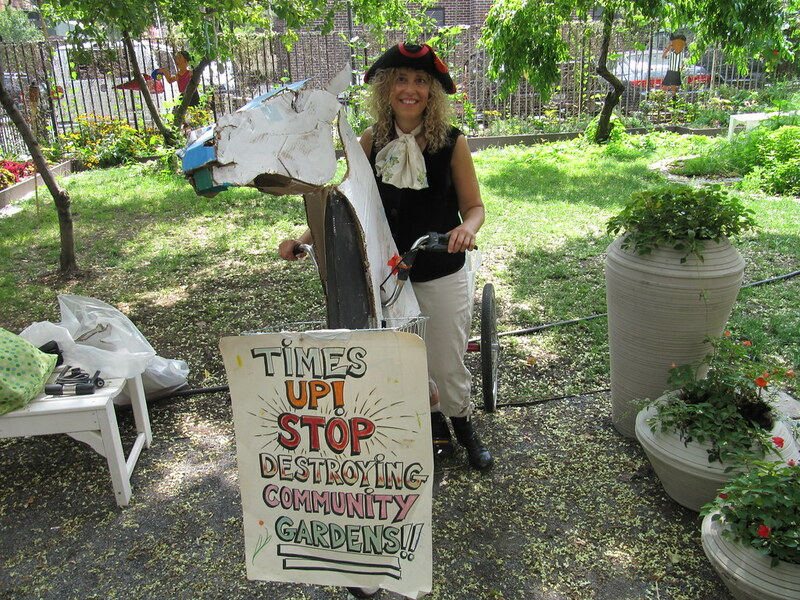 . . garden supporters - dressed as Paul Revere - will join a Garden Bike Ride organized by Time’s Up!, a direct action environmental group, to sound the alarm and call attention to new rules being drafted by the City that allow gardens to be legally transferred to developers and risk the destruction of hundreds of community gardens. The new rules would replace the 2002 Preservation Agreement, which allowed gardens throughout the city to thrive over the last decade. The 8-year-old Preservation Agreement expires on 9/17/2010. Cyclists will ride their “horse cycles”- bicycles with cardboard horse heads attached to the front, and visit several Lower East Side Gardens before heading up to Mayor Bloomberg’s house where they will bring the Mayor flowers, cucumbers and greens from endangered community gardens." If you don't have a bike, join in anyway. Losing our public green spaces to more development would be absolutely devastating for our neighborhoods.